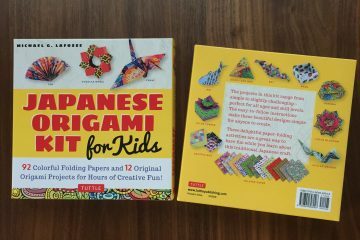 Travel Origami: 24 Fun and Functional Travel Keepsakes by Cindy Ng is one of those books that were gifted from Tuttle Publishing for me to review before it was published. To be honest, I probably would not have picked out this origami book personally myself. 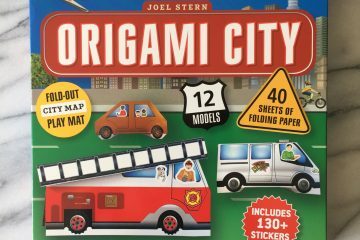 But this would be a great book for someone who has never done origami but curious, and wants an out-of-ordinary activity while traveling. The concept of folding paper souvenirs into fun and functional keepsakes is fantastic. As an avid traveler I often find myself with a bunch of maps, brochures, tickets, foreign currency, etc. wherever I go. I’m sure that this happens to all travelers. This book gives a lot of ideas about what you could do with those paper goodies, candy wrappers and even drinking straws. Travel Origami actually became one of my travel companions during my trip to Japan this summer. The photo below is a Postcard Star model that I folded during my bullet train ride, out of 8 postcards that I picked out at a museum. The model required some double-sided tape for assembling so I waited to put it together until I got home. Once I assembled it at home I put this Postcard Star over my dog’s head and it happened to fit him perfectly. I couldn’t stop giggling. I often put on things like this on my dog, and this may seem humiliating even for a little wiener dog. But he always gets some treats for modeling in the end so he doesn’t seem to mind. As the holiday season coming close, I am sure that many of you would be traveling at some point, or looking for gifts for loved ones. 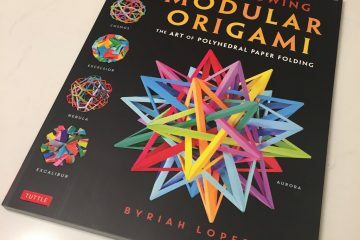 This book would make an unique gift for someone, perhaps a child, who is origami curious and creative enough that is not satisfied by just ordinary activities while traveling (I estimate that would be more than a half of children out there). With this book, those long airplane or train rides could become not only more fun and creative, but also help bring in more memories from the trip.